Preliminary design drawing for a scout cruiser. This design was one of many considered in the process of settling on the plans adopted for the Pensacola (CL-24) class of Fiscal Year 1926. This sketch was one of four undertaken as part of the work leading up to development of a set of five alternative designs (see Photo # S-584-174 to Photo # S-584-178) that were presented to the General Board in March 1921. This design provided one triple 8-inch gun turret forward and two turrets aft, one twin and one triple. It differed from preliminary sketch # 3 (see Photo # S-584-172) in having a larger area of armor protection and in a different disposition of the main battery. 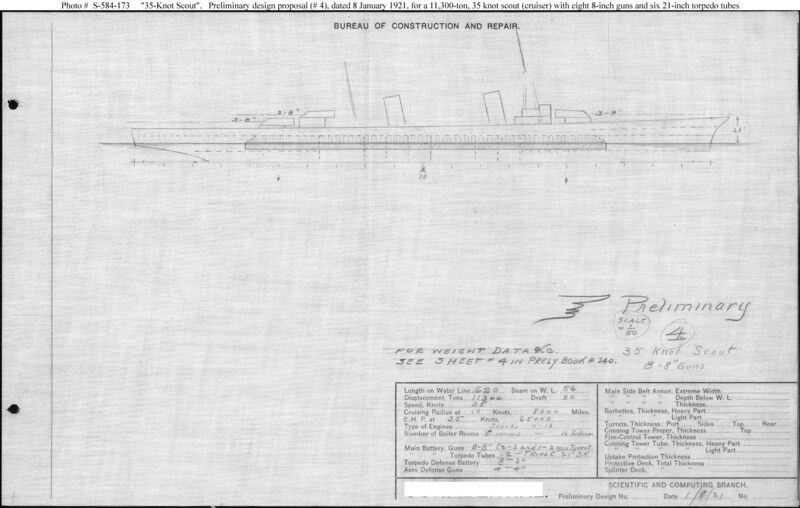 This plan provided eight 8-inch guns, turbine machinery, and a speed of 35 knots in a ship 620 feet long on the waterline, 56 feet in beam, and with a normal displacement of 11,300 tons.